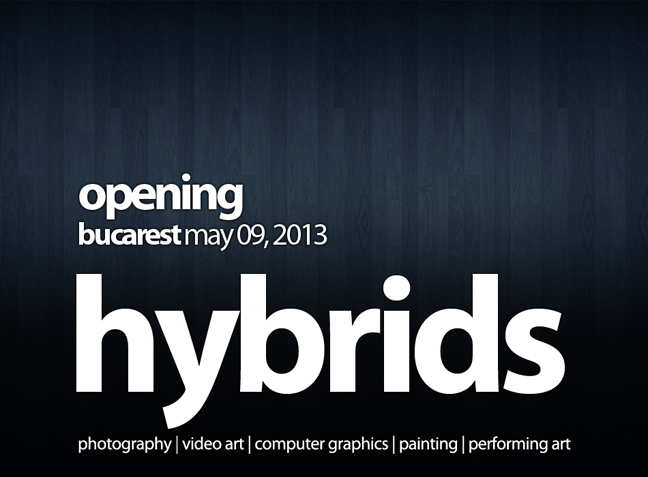 HYBRIDS – International Art Festival of Photography, Video Art and Painting will be held in the city of Bucarest (Romania) at ART HUB ApPAC, Asociatia pentru Promovarea Artelor Contemporane, from the 9th to the 16th May 2013. Twenty artists, from different countries, have been selected to be part of this project. The selection has been based on the main concept of hybridization between identities and urban environment. People, backgrounds, societies, progress and all their inputs create hybrid identities, modifying each other and being mixed in prospect to shape a better world. Mixing sustainable transport; modern (ICT) communication infrastructure; sustainable economic development; and wise management of natural resources, human, intellectual and social capital, is the key to reach a future better life quality. Be smart. Be hybrid. Be better. ApPAC, Association for the Promotion of Contemporary Arts, is a non-profit organization founded in 2009 by artists and cultural managers in an effort to support and encourage the Romanian cultural values. The Association also aims to support cultural exchange between artists from Romania and from abroad and also their contribution to the development of a healthy cultural environment and educate the public in the spirit of contemporary art, facilitating access to culture.